For men who understand the subtleties of being well-dressed, looking great is all about balancing your look. Certain details and measurements of your outfit should be directly proportionate to the silhouette of the overall outfit you’ve chosen to wear. For example, the breadth of your shoulder line will help to determine the width of your suit’s lapel, and the size of your pocket flap will be echoed in the girth of your pant leg dimensions. When it comes to neckwear, balance—both in color and dimensions—helps to create that wow factor that helps you close the deal, land the account, or in other words, win. This keeps you memorable in the minds of the most powerful people in the room. There are wide ties, medium ties, and slim ties. So, how do we know which width looks best? Does it depend on your body type? The occasion? The answer is simple: Your neckwear should help your outfit—not make it, but help it to achieve that overall look you originally intended. Generation Y has reintroduced slim ties to the forefront of men’s fashion. However, when you wear a suit with a wider lapel, that exaggerated slim tie doesn’t look quite right. Remember, you’re not Generation Y. In fact, it can look like you’re wearing your son’s tie—because your suit jacket isn’t cut like your son. Your look needs to be balanced accordingly. 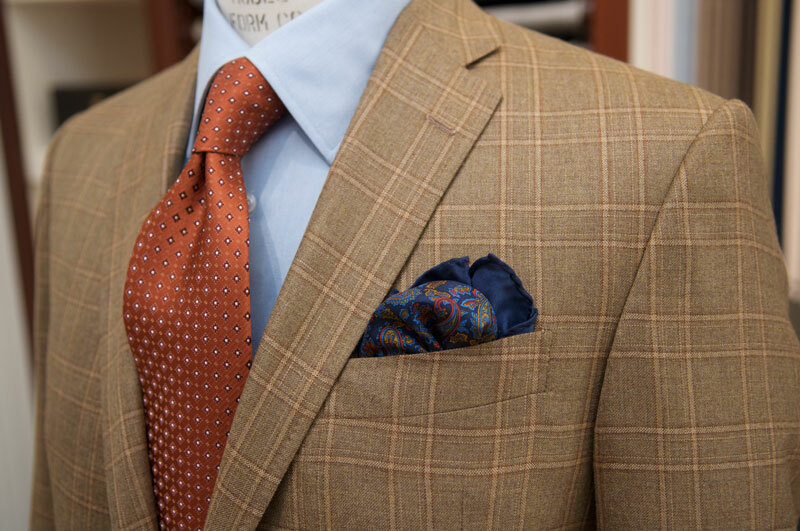 With balance in mind, we can and do make most of our ties custom—so they fit precisely with each jacket we’ve made you. To achieve your best look, we personalize every aspect of your neckwear, including length, width, thickness, and throat size. Throat of a tie? Yes, sir—the throat area of a tie is the part that will sit near and under the collar. Along with the shirt collar, the throat of a tie really determines whether the best knot is a Four-in-Hand, Windsor, or Half-Windsor. 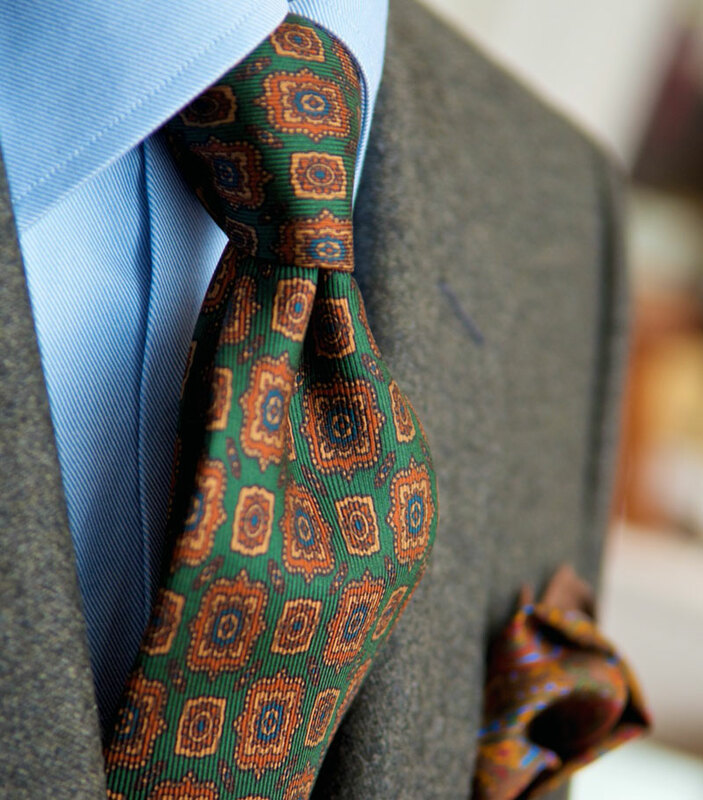 With custom neckwear, we can create your ties based on you and the type of knot you’ll want to make. Most men who wear ties know how to tie them. But like dancing, they might know the steps but have not mastered the art of the dance… or the tying of that perfect knot. An ideal tying technique can make your knot look extraordinary—and it’s crucial to get that dimple just right. If the dimple below your knot is right, it gives your tie dimension and character. The tie enhances, completes, and balances your outfit. If not, it can grab people’s attention the wrong way. To command the attention you want, also mind your neckwear’s material. 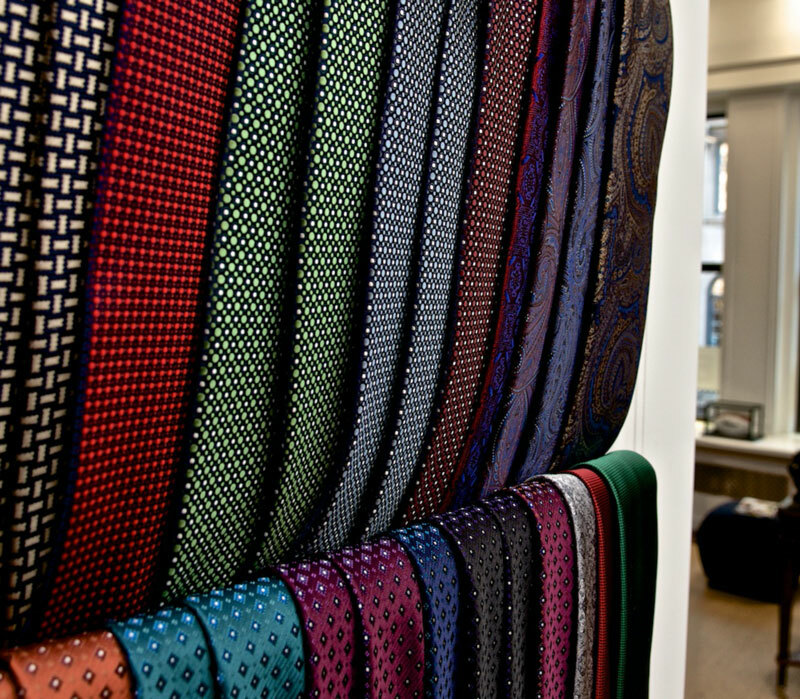 With ties, there are different finishes for different occasions and times of day. For instance, satin neckwear has a smoother finish—with the stunning, subtle shine for an evening affair. Pair a satin navy blue and silver striped tie with a dark navy suit, and you’ll grace any nighttime event with balanced elegance. But if you want to wear the same tie the next day, satin won’t achieve that stunning effect. We can incorporate that striking navy blue and silver stripe design into a cashmere woven tie appropriate for when the sun is out. Daytime ties often have more texture than evening neckwear, which usually features an element of shine. The art of dressing isn’t about how long you spend getting ready—or how much time it takes to choose the right material, colors, and knot. Dressing well is not about how much time you look like you spent. Trying too hard often has an adverse affect on your wardrobe. The trick is to look your absolute best—without looking like you tried too hard. That’s why it helps to have a razor-sharp professional on your side.